For me, Julien Macdonald’s show is always a highlight of the LFW schedule. More often than not, grey skies and rain make an appearance so it’s a welcome relief to be transported into Macdonald’s high octane, super glam world. This season, Macdonald took his inspiration from Africa, albeit a luxurious molten gold Africa with a rock ‘n’ roll edge. Next season, expect to see the Julien Macdonald girl clad in all shades of metallic with snakeskin and fringing details and cutouts galore. A stunning collection which was opened and closed with model-of-the-moment Hailey Baldwin, but for a show inspired by Africa I would have liked to see a bit more diversity. 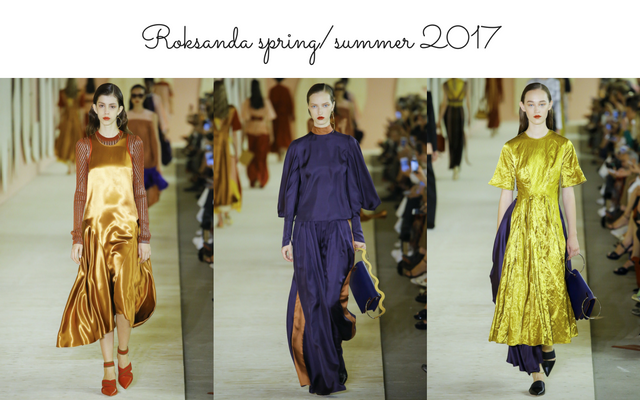 At first glance Roksanda Illincic’s vision of summer in 2017 doesn’t look, well, very summery. Long, languid layers in a colour palette of saffron, burnt orange, cool navy and liquid gold seem more well suited for autumn than summer. But with her signature effortless elegance, she has created a beautiful airiness with voluminous silhouettes which make me think of long, lazy days in Capri. A stunning collection. 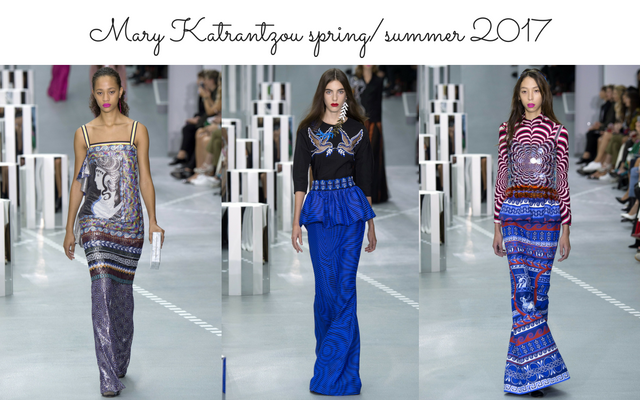 This season sees Mary Katrantzou return to form after a couple of tricky seasons. Known for her signature digital prints, Katrantzou diversified away from this aesthetic but spring/summer 2017 sees her return to her roots in more ways than one. Ancient Greek references such as key patterns and vase-like silhouttes merged with psychedelic prints resulting in a bold, sometimes chaotic, collection. Like the Roksanda show layers were key, skater dresses layered with slip dresses, peplums layered over maxi skirts, floaty tunics layered over flared trousers. Ancient Greece meets bold retro prints for huge style statement that is sure to grace the style set next season. 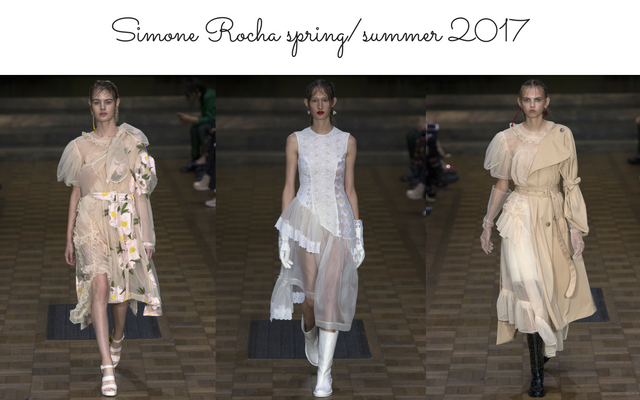 Simone Rocha is a master of the artful juxtaposition and spring/summer is no exception. Pretty, white lace and buttercup yellow dresses contrasted with heavy duty rubber gloves and Perspex boots, inspired by Jackie Nickerson’s farm photography. The resulting off-kilter collection lands just on the right side of pretty, with the utilitarian accessories grounding the frothy innocence of the organza and broderie anglaise As usual, a standout collection during the LFW schedule. 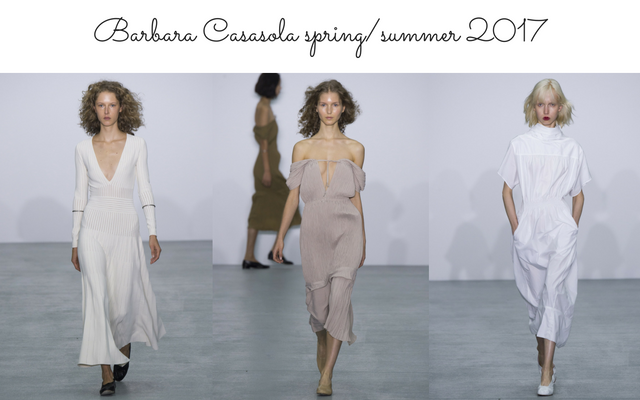 Barbara Casasola’s spring/summer 2017 collection offered up a clean palette, a welcome change from London’s inevitable carnival of colour and print. Beautiful 50s Italian vibes echoed through the collection, with full skirts and runic tops alongside signature ribbed knitwear in an earthy, neutral shades. There was something extremely satisfying about such a clean, beautiful collection which has me yearning for summer.